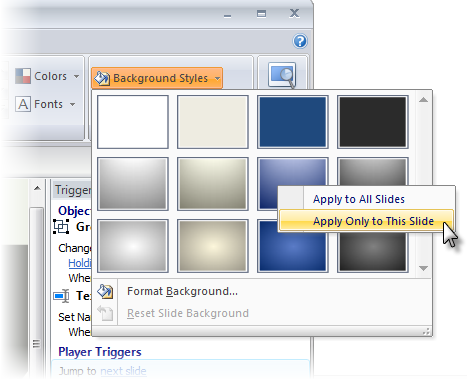 The background tools in Articulate Storyline allow you to quickly change the background fill on any course slide. You can choose from several background styles that Storyline provides, or you can create and apply your own background fill. In this tutorial we'll look at both options. Go to the slide where you want to add a background style. Hover over any of the thumbnails to see how the background will affect the look of your slide. To apply a background to all slides in your course, left-click it (or right-click and choose Apply to All Slides). To apply a background to only the current slide, right-click and choose Apply Only to This Slide. 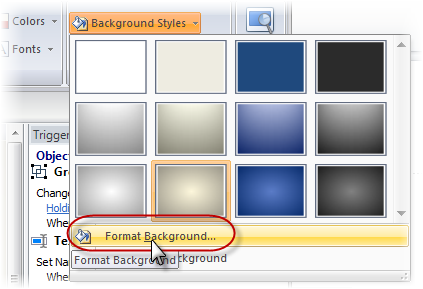 Choose the Background Styles dropdown, and click Format Background. The Format Background window appears. Use the Fill tab to choose one of the fill options, and set your preferences in the fields that appear. 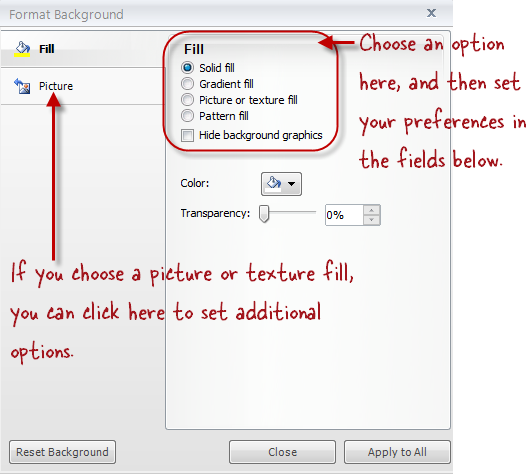 If you choose to fill the background with a picture or texture fill, you’ll also be able to use the Picture tab of this window to set some additional options. 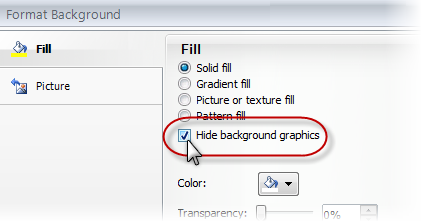 If you’d like to hide any background graphics originating from the slide master layout, you can mark the Hide background graphics box. If you’d like to apply the same background to all slides in your course, you can click Apply to All. If you change your mind and want to revert to the previous background you used for the slide, just click Reset Background. Another way to control the look of your slide backgrounds is by creating and applying slide master layouts. You can find out more in the tutorial on Using Slide Masters.